Vascular arrhythmia - what it is. Vascular arrhythmia in adults and children, the heart rate on the ECG. he cardiovascular system is closely associated with many other organs, including the central and peripheral sections of the nervous system. In case of a disorder of the latter, vascular arrhythmia often occurs. What is it for the state and why it develops is important to know whoever is diagnosed with VSD. The heart is a hollow organ, which pumps the blood through a small and large circle, which allows the delivery of oxygen and nutrients to all organs and tissues, as well as the elimination of life products from the body. If there are functional or organic factors that lead to disturbances in the activity of the heart, a cardiovascular disease of varying degrees of severity arises. In the normal state, the heart performs 60-90 beats per minute and its rhythm is characterized as a constant, ordered, coming from the main driver of the rhythm - the sinus node. When exposed to the heart of adverse factors, in most cases, the rhythm of its activity is broken, which is manifested by attacks of varying intensity. Both the external and internal factors can play the role of the root causes, but in some patients, arrhythmia develops due to the disorder of the activity of the autonomic nervous system. In medical practice, a similar form of heart rhythm disturbance is known as vascular arrhythmia, it is dangerous whether this condition will be considered in more detail. Arrhythmia, or a violation of the heart rhythm, is associated with various diseases in its pathogenesis, because in rare cases it is an autonomous pathology. The heart primarily affects the nervous system and with the disorder of its departments, as it happens in the vegetative vascular dystonia, changes in the frequency of cardiac contractions can be observed both in the direction of increase and in the direction of reduction. Vascular arrhythmias are most commonly seen in persons prone to imbalance of the nervous system, which, in addition to VSD, can be observed phobias, neuroses, etc. In the pathogenesis of vascular arrhythmia, the mechanism of disorder of the sympathetic and parasympathetic nervous system is established. Under the influence of various factors (stress, hypodynamia, climate change) there may be a dysfunction of certain departments, which is expressed by the corresponding symptom complexes. Children and young people are especially sensitive to changes in neuro-regulatory, therefore, vascular arrhythmias are most often present at this precarious age. They are associated with the predominant effect of the parasympathetic or sympathetic department of the nervous system. With sympathicotonia (the sympathetic system prevails), tachycardia is often observed, blood pressure may increase, and the skin becomes pale. A person feels chills, in some cases accompanied by a pronounced sense of anxiety. Then speak for panic attacks, which are characterized by overexcitation of the nervous system. With vagotonia (the parasympathetic system prevails), the cardiac rhythm slows down, the breathing becomes heavy, the skin of the face blushes, sweating increases. In this case, the pulse is trimmed to 45-50 times per minute, and the blood pressure can also decrease. In clinical practice, cardiovascular syndrome is also known, manifested by cardiac pain, which is associated with emotional stress. Against the background of these symptoms, a volatile pulse is detected, a rapid heartbeat, and functional hearings are determined during listening to the heart. At the heart of a rhythm disorder is a neurocirculatory disorder. The more autonomic disturbances are expressed, the more severe the heart and other organs will develop. hormonal changes occurring during pregnancy, climacteric, puberty period. Predisposing factors VSD, and means - a vascular arrhythmia, it is possible to consider frequent stressful situations, presence of bad habits, the wrong diet. This is especially important for a young body, so children's and adolescence should pay attention to the proper day regime. The pathology is mainly associated with an increase in the heart rate, while maintaining the correct rhythm, which is referred to as sinus tachycardia. Also vascular arrhythmia can be expressed in extrasystoles. Both forms of rhythm disturbance often do not cause significant discomfort in the patient, therefore, they do not require special treatment.Only too emotional people may need antiarrhythmic medication. It arises both in children and adults, and varies in two forms: physiological and pathological. The first species is the natural response of the organism to external stimuli - stress, the use of coffee. Pathological arrhythmia is observed in a calm condition and significantly impairs the quality of life of the patient. Vascular sinus arrhythmias often occur on the background of VSD, while not all patients feel an increase in heart rate.Therefore, rhythm disturbances are often diagnosed for the first time on prophylactic examinations or during an appeal to a polyclinic for another illness. Characteristic for young people and children. It can also occur with hormonal changes in the body, which is often observed during pregnancy and climax. Therefore, the causes of their occurrence may become common for both vascular arrhythmias and vegetative vascular dystonia. They represent a large group of disturbances of the conducting system of the heart, in which organic changes are often not observed. Only in difficult cases the fading and fibrillation join the extrasystole. If the pathology runs asymptomatic and does not cause discomfort in the patient, then do not worry. First of all, electrocardiography is prescribed, which can detect most of the rhythm disturbances. Depending on the type of arrhythmia, the characteristics of the ECG will be determined. 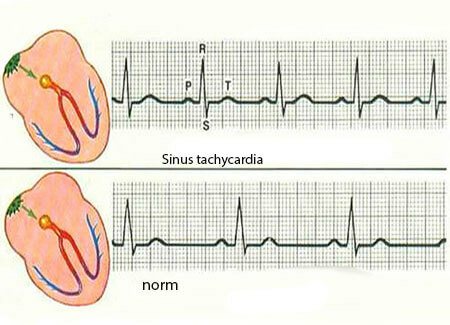 the pronounced sinus tachycardia is indicated by the increased amplitude of the tooth P in the first two leads, as well as the shortened interval PQ. Extrasystole is very variable, but the ECG is most often expressed as tachycardia, that is, the above-mentioned ECG signs are observed. At an atrial extrasystole, the tooth P will be deformed, and with the ventricular - the QRS complex will be expanded. Extrasystoles from the atrioventricular compound are decoded on an electrocardiogram as the absence of the tooth P, which disappeared in the QRS complex. Electrophysiological study - helps to determine arrhythmogenic focal point. Daily ECG monitoring is effective in 80% of cases, since it helps to diagnose asymptomatic arrhythmias. Asymptomatic leaky arrhythmia does not require special treatment. In the presence of a patient with extreme discomfort, antiarrhythmic drugs or beta-blockers are prescribed. Diminished to those activities that are shown in vegetosocial dystonia. For children and adolescents, it is recommended to strengthen the nervous and cardiovascular systems with regular physical exercises. In this case, the load should increase smoothly, only then will a positive result be achieved. Also, if possible, you should visit the massage rooms and physiological procedures, to undergo sanatorium and spa treatment in specialized medical institutions.